The front: Staub is looking out over the cramped dugout of Tiger Stadium. Check out the wooden dugout bench. The back: Without looking it up, I would guess that the only other player in this set with “Colt .45s” in the stat line would be Joe Morgan. 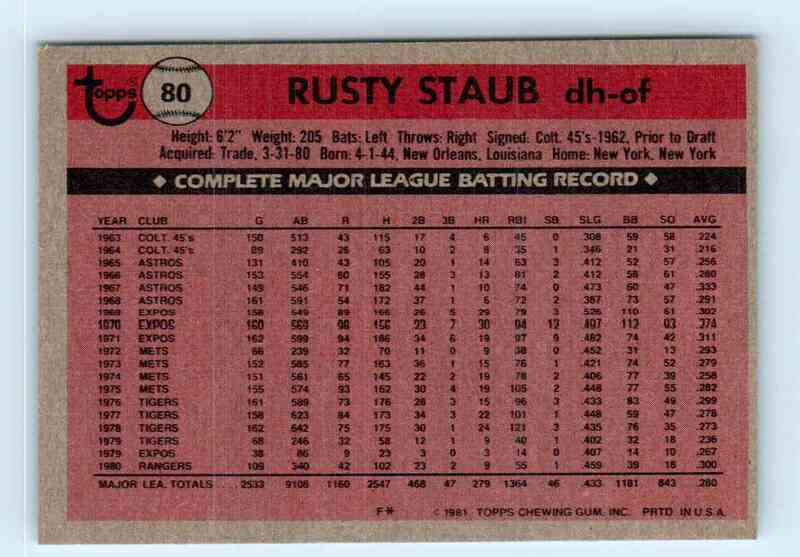 The player: 1980 was Staub’s only year in Texas. Everywhere else he played – Houston, Montreal, Detroit and the Mets – he was a huge fan favorite. 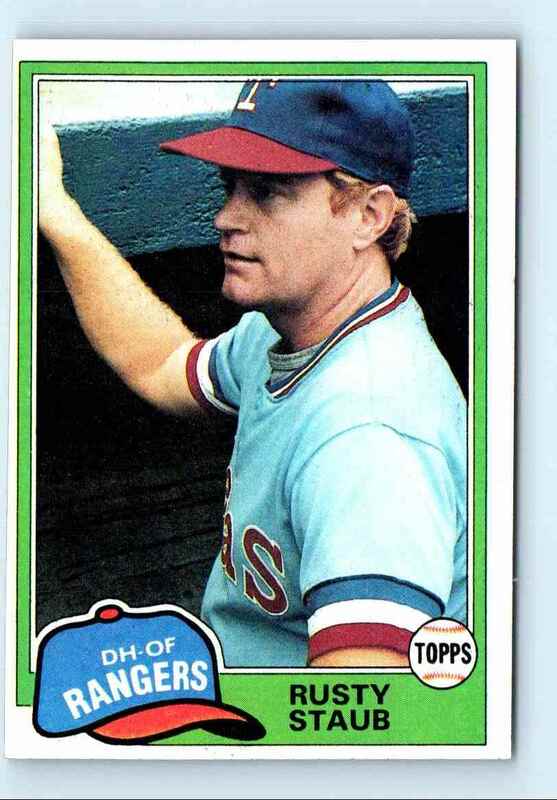 An All-Star five times between 1967 and 1976, he reinvented himself as an excellent pinch-hitter in the 1980s. Overall, in 2,951 games he hit .279 with 499 doubles, 292 home runs and 1,466 RBI. He walked 1,255 times, compared to just 888 strikeouts. The man: Staub did not have a 1972 or 1973 Topps card due to a contract dispute. Overall, though, Staub was known as one of the genuine “nice guys” on and off the field. After his career he opened two successful Manhattan restaurants and was deeply involved in many charitable endeavors. He passed away in March, 2018. My collection: I have 28 of his cards, from 1967 to 1986. I would be interested in trading for 1963 Topps #544, 1964 Topps #109, 1965 Topps #321, 1966 Topps #106, 1968 Topps #300, 1970 Topps #585 and 1971 Topps #560. Vintage backgrounds: Wrigley Field outfield? Vintage backgrounds: Wrigley Field grandstand?